Extend the Life of Your Playground & Keep Your Kids Safe Our FREE Playground Maintenance Checklist provides Helpful routine guidelines that will increase the life of your playground and provides informative tips to increase the durability of play equipment as well as valuable safety instructions to keep your children safe. Depending on the type of surfacing you have, different factors will have to be considered. Older PIP or rubber tile surfacing will need to be inspected for deterioration, while loose fill surfacing will need refills and checked for foreign objects & debris. Ask a consultant about our playground wear mats to help your surfacing last longer! Rainy weather is unavoidable. Your entire outdoor play area must have satisfactory drainage, especially in heavy use areas such as under swings and at slide exits. This will reduce the risk of slips, bacteria, bugs and other hazards on the playground. While our safety inspectors will thoroughly examine any playground equipment for any general hazards the day of installation, damage may take place over time. Make it a habit to check your play space for any sharp points, missing protective caps, open S-hooks and other general playground maintenance hazards monthly. Depending on the age of your playground, components may become loose or wobbly. It’s important to inspect playground equipment with moving parts like swing hangers, bearings and track rides. If you find yourself having to do frequent repairs, it may be time for a new play set. Visual aspects of wear and tear like rust, rot, cracks or splinters on playground equipment are good indicators of bigger problems. It’s important to remember site amenities as well. Be sure to ask your sales consultant about playground equipment warranties to see if these damages can be covered. As summers get hotter, paint can struggle to stand up to the abuse. Make sure the paint (especially lead paint) is not peeling, cracking, chipping or chalking. To greatly improve the life cycle of your playground, ask a play consultant about adding shade structures to your existing or new playground. BYO Playground offers standard playgrounds, but all BYO Playground Play Structures are fully customizable. Custom create your dream playground with our flexible solutions. While these structures are of the highest quality, regular playground maintenance will still be needed. Ask you playground consultant how you can extend the life of your playground structure. All custom playground services are 100% FREE OF CHARGE! Call 800-853-8316 for instant service! Playground Maintenance: Need a Sign? Since the founding of the International Play Equipment Manufacturers Association, or IPEMA, there has been a trend in playground signs that help to educate users on the proper ways to use playground equipment while promoting safe play. "IPEMA has taken a leadership role in providing and sharing information through its website and through its individual members," says IPEMA board member, Tom Norquist. "IPEMA has worked on how to properly site appropriate signage as it pertains to the age of the prospective user. Also, this signage is for coaching users to check out the playground before putting their kids in that environment." A new playground isn’t just another purchase – it’s an investment. When it comes to the life of your playground equipment, regular inspections are important to protect that investment. 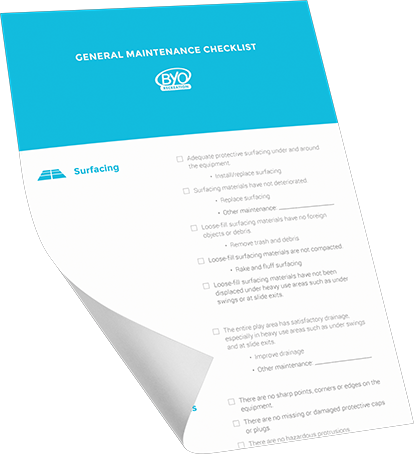 In addition to BYO Playground’s excellent playground equipment warranties, we have also compiled a FREE Playground Maintenance Checklist to help your play space last for years to come.